IN THE DEEP Healthy shallow reefs, like this one in Micronesia, are at increasing risk. Researchers previously hoped that species from these reefs could survive in deeper reefs, but new evidence shows this may not be the case. 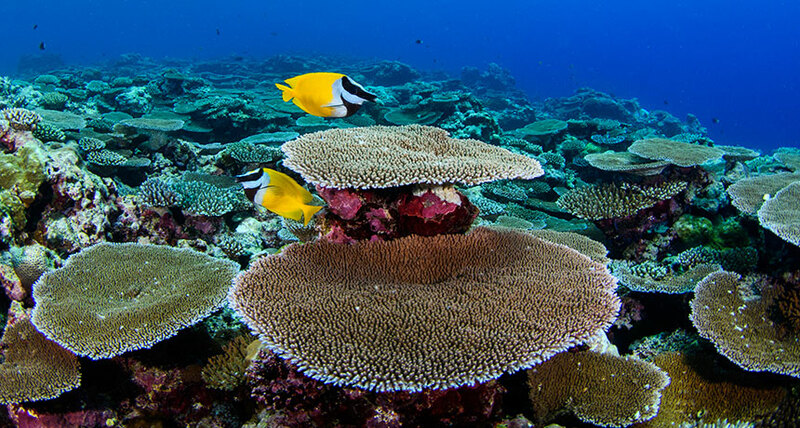 Deep water reefs are unlikely to be safe harbors for many fish and coral species from shallow reefs threatened by climate change and human activity. Shallow water creatures may have trouble adapting to conditions in the deep, scientists report in the July 20 Science. Plus, deep reefs are facing the same threats that are putting shallower ones at risk. The study deals a blow to the “deep reef refugia” hypothesis. That’s the idea that species from troubled shallow reefs could simply move to reefs at depths of 30 to 150 meters, called mesophotic reefs because they exist at the limits of where sunlight reaches. Even though individuals of a typical shallow water species may be spotted at a wide range of depths, it doesn’t mean the majority of that species could survive living in deeper waters, says study coauthor Luiz Rocha, a zoologist at the California Academy of Sciences in San Francisco. “When you start looking into details,” Rocha says, “a lot of these species don’t actually live in these depths.” But there was scant data, partly because seeing these species requires scientists to undergo technical diving training. Rocha and his team wanted to figure out which, if any, shallow water species can also thrive in deep water reefs. And the only way to do that was to get wet. The scientists made dozens of dives to depths of up to 150 meters in waters off the Philippines in Asia, the Caribbean island of Curaçao, the mid-Atlantic island of Bermuda and the western Pacific island nation of Micronesia. While cataloging 687 coral species and 1,761 fish species, the team found that deep water ecosystems were strikingly different from surface reefs and had many distinct species evolved to live in darker and colder waters.